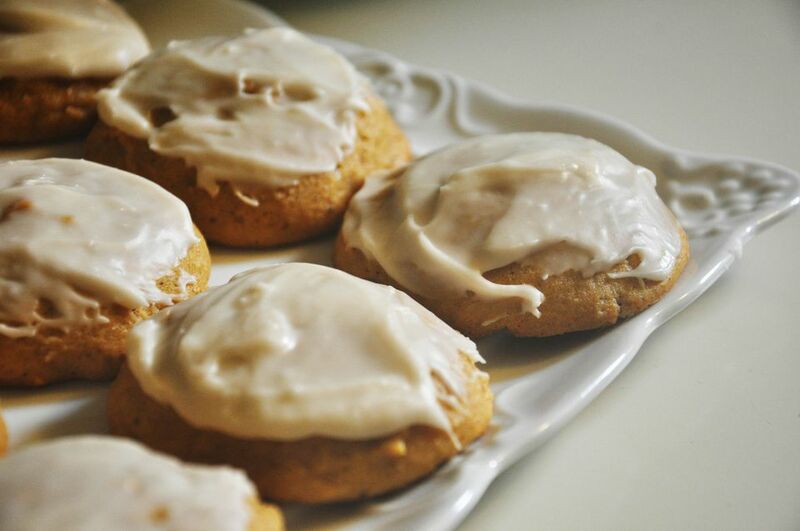 These cinnamon-glazed pumpkin cookies are soft, spiced treats perfect for fall. Enjoy this gluten-free cookie with a mid-day cup of tea or pack them in lunch bags for an autumn treat. Line 2 large baking sheets with parchment paper, silicone pads, or lightly grease. In a medium mixing bowl combine gluten-free flour, baking soda, cinnamon, nutmeg, and guar or xanthan gum (if your mix does not contain gum already). Whisk until thoroughly combined. In a separate mixing bowl, cream butter and sugar until light and fluffy. Add molasses, egg, pumpkin puree, milk, and vanilla. Beat until blended. Slowly add the dry ingredients to the wet ingredients and stir until combined. Drop cookies into generous rounded teaspoons on prepared baking sheet. Bake for about 12 minutes in preheated oven. While cookies are baking prepare glaze by whisking confectioner's sugar, milk, cinnamon, and vanilla in a medium bowl until smooth and glossy. Cool cookies for 1 to 2 minutes. Spoon or brush glaze on cookies. For larger cookies, drop batter on a prepared baking sheet by using a rounded tablespoon and bake an addition 2 to 3 minutes or until the cookies are done. Make sure your work surfaces, utensils, pans, and tools are free of gluten. Always read product labels before buying. Manufacturers can change product formulations without notice. When in doubt, do not buy or use a product before contacting the manufacturer for verification that the product is free of gluten. If you don't have cinnamon and nutmeg, try substituting "pumpkin pie spice," which is a seasonal spice mixture that contains the two spices (and others). If you have fresh pie pumpkins, you can use the pumpkin flesh instead of canned pumpkin. Make sure you have removed all the seeds, steamed the flesh, and made a smooth puree of it. You'll only need one cup for this recipe, so add it to other recipes. Guar or xanthan gum can be found in baking stores, better grocery stores, or online.